Walking into Russ and Daughters felt like homecoming. It transported me back to my cultural and culinary roots. Oh wait, wrong ancestry. I am not a Jew of Eastern European descent, but Russ and Daughters gives you a sense of time of place of a bygone era and belonging. A throwback into a sepia toned movie, from the push cart days of lower east side, Manhattan, in the turn of this century. Whether you are a Japanese tourist, a retiree from Texas visiting the city or an Indian-Israeli-American like me, you feel like one of the characters in this real life motion picture. Even Hollywood couldn't script it any better. The brilliance of the fourth generation cousin duo, who's carrying on their Russ and Daughters family tradition, is how they keep this historic institution, 'appetizing store', relevant today while staying true to its authenticity. No wonder young and old flock to the narrow corridor of a place as if it were sort of a Mecca. Current, yet frozen in time. It's hard to believe it was my first visit to Russ and Daughters, an 'appetizing store'. It's not a deli as I learned. Deli by definition sells meats like the pastrami on rye at Katz's Delicatessen. Everything else that is parve, dairy, dried fruit and candy is sold separately at an 'appetizing store'. Appetizing, an adjective and as in this case, a noun too, as described in Edible Manhattan's Russ and Daughters article. The gentlemen behind the counter skills at slicing smoked salmon paper thin are comparable only to the best of the sushi masters in the world. The repetitive slicing motion, titillating. 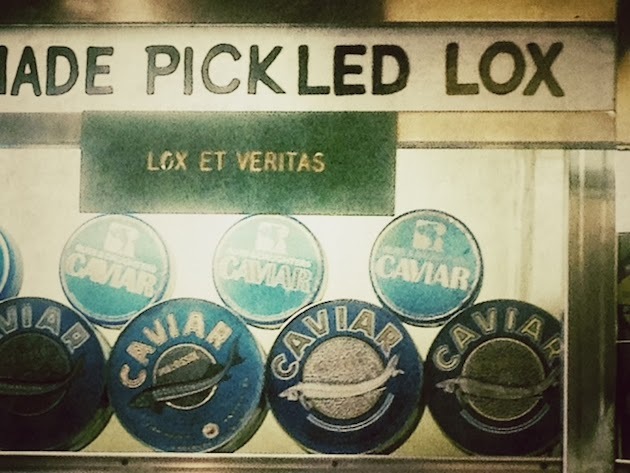 Paper thin, translucent Nova (cured in low heat) and Lox (cured in salt) slices melt in your mouth. Thicker slices have undesirable chewy bite. I walked into this packed narrow isle on a Friday, Thanksgiving weekend. This was one of those rare occasions when I didn't mind the wait. It was a way to soak it all up and an excuse to linger. When my number was up, this gentleman, who works there for 13 years, was the one who patiently assisted me. When I asked for a dabble of the scallion cream cheese he got such a kick out of it. He turned to his colleague, who's been there for 31 years, and said "dabble, I like that", which amused them both. A word game of sorts erupted and he continued "a dabble, a thimble and a bissel (or bisl, a little bit in Yiddish)' which made his colleague smile further. Original image before I vintaged it. Vintaged, 2nd phot from the top. 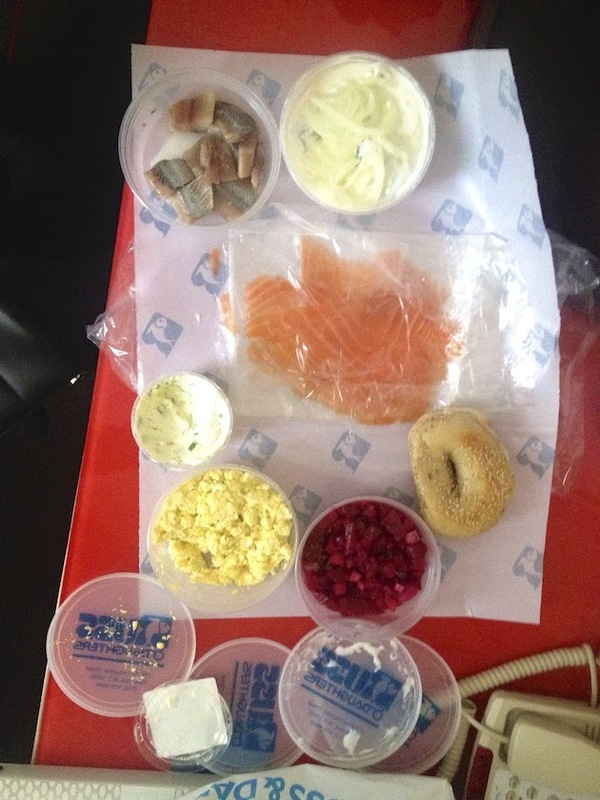 I've ordered for S, who was back at the hotel, a Gaspe Nova smoked salmon with scallion cream cheese on hand rolled and boiled sesame bagel. Jonathan and I picnicked at the hotel on the spread above. The egg salad was incredible. There was an extra ingredient, with a crunch, that I didn't give myself time to analyze. The herring in cream and pickled onions, with a subtle sweetness, was such a melt in your mouth delicacy, that it completely took me by surprise. Lastly the smoked salmon, gosh, paper thin, at its finest. I am anxiously awaiting my re-descent upon NYC to try the wasabi roe Super Heebster and explore further everything smoked fish. 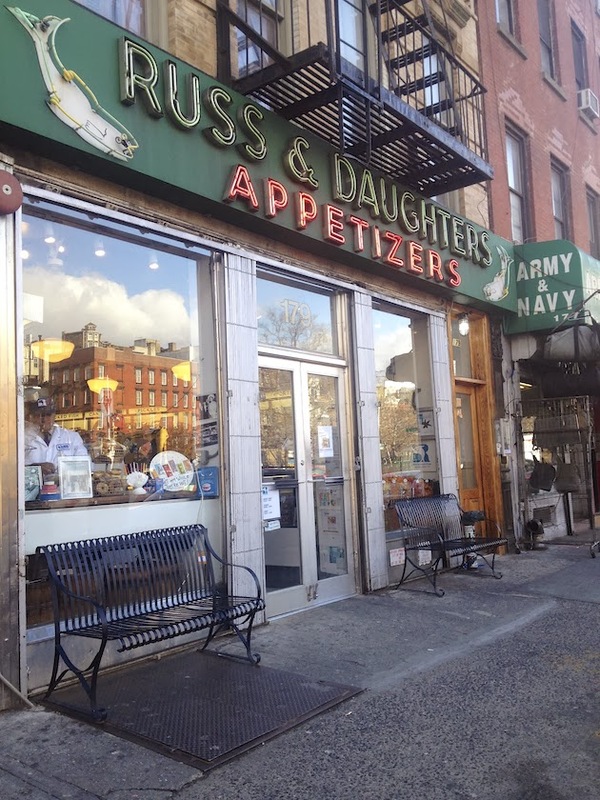 I hope the much anticipated Russ and Daughters Cafe on Orchard Street, might, just might be open by then, to mark this institution's 100th year anniversary in 2014. I envy you New Yorkers for this relic of an establishment that is a part of your DNA. This post was photographed with my iPhone. A fabulous store! I wish we had such places here in Switzerland. Me too I wish I had it in my neighborhood, Rosa. Would love to visit the store the next time I am in NYC. Asmita, let me know when you do. Wonderful review! I am gonna have to check out "Russ and Daughters" the next time I am in NYC! TY Shashi. Let me know when you do. What I wouldn't give for a shop like that here. I love it. Me too. I wish I had it in my neighborhood, Maureen. It's only 4 hour drive but we do not get into NYC often enough. A bissle in yiddish is a piece or a bit of something. My grandparents used to use that word. So anyway-last Spring my son was visiting friends in NYC and he found himself wandering around and he tells me that he stopped in this store and had the best bagel and lox of his life. I asked him where he was to which he replied Russ and Daughter's. He had no idea that it was such an institution! I must say though that somehow he always ends up in just the right spots. Intuition, I guess. Or maybe...just good genes! Russ and Daughters looks like the perfect place to visit and get some great smoked salmon and other deliciousness. I love that it is a 4th generation business. That is truly incredible. So much fun to follow your NYC trip through IG and these posts. 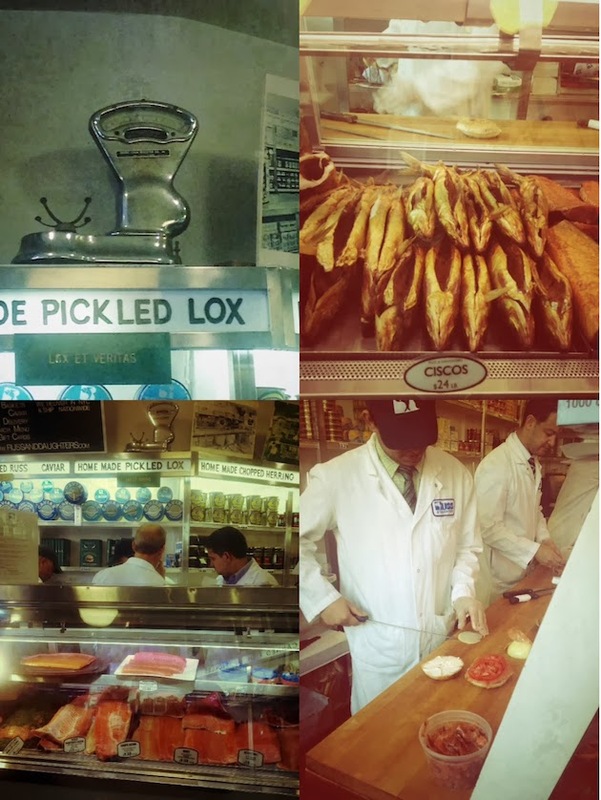 "It's hard to believe it was my first visit to Russ and Daughters..." -- But you know it won't be your last! My husband and I were lucky enough to get a few minutes with owner Niki Russ when we were there several years ago. I'll never forget it. I still have the container top from the "tupperware" they put our who-knows-what in! Having grown up in Brooklyn across the bridge from the Lower East Side, the area and Russ & Daughters are part of my childhood and as such very special to me. Ad mea v'esrim ('Til one hundred and twenty) ... at least!